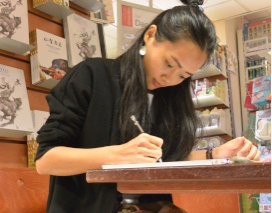 Because her real name is so common in China, ‘Zao Dao’ adopted this pen-name, which means ‘early rice’, as a reference to the month of her birth in 1990, July, when the first rice crop is harvested. 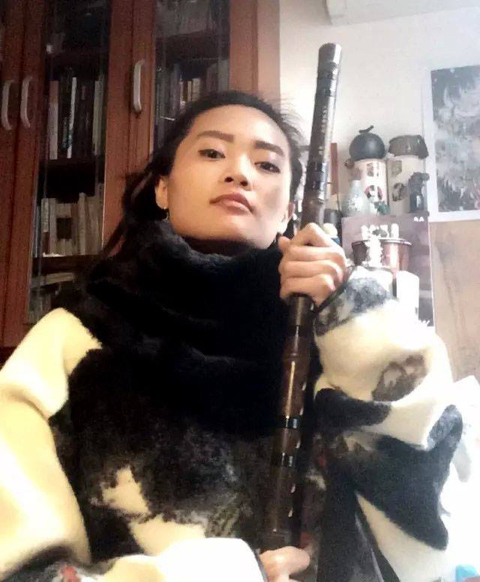 It has proved appropriate for this precociously brilliant artist, who at the age of 25 has become an internet phenomenon, while still living in the isolated village on the outskirts of Kaiping where she was born. 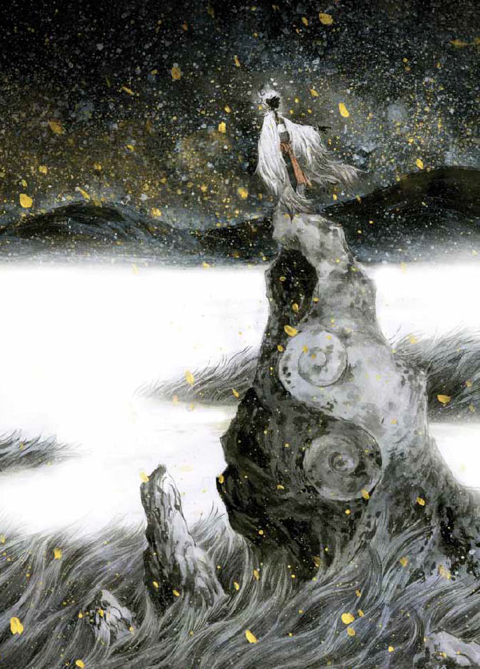 While China’s often conventional mainstream found her maverick mash-up of styles bizarre, an independent publisher approached her in 2013 to commission her first book, a wordless narrative blend of illustrations and comics entitled Song of Sylvan. “I finished it in April 2015. 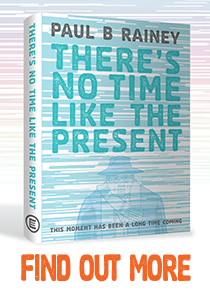 The publisher decided to launch its sale on the internet on the morning of my 25th birthday in July. 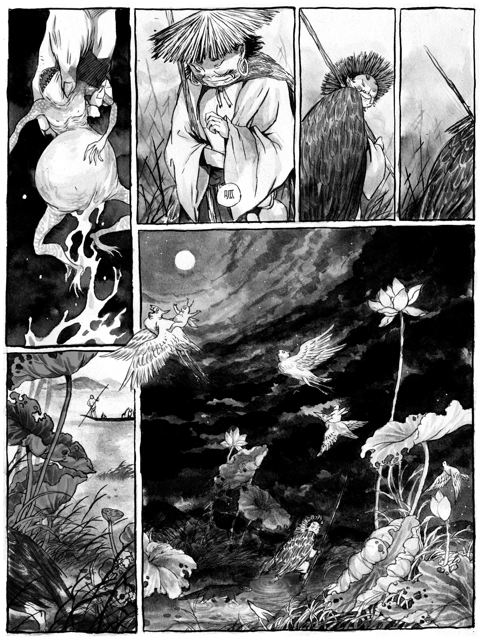 When I woke the following morning, all 4,000 copies of the first printing had sold.” Three reprints swiftly followed and when Mosquito Editions released a French adaptation in September with some additional explanatory texts, Zao Dao was invited to comics festivals in Grenoble and Algiers, further cementing her increasingly international following. She remains discreet about her next book project in gestation, but enjoys sharing free-form graphic short stories with her fans online. 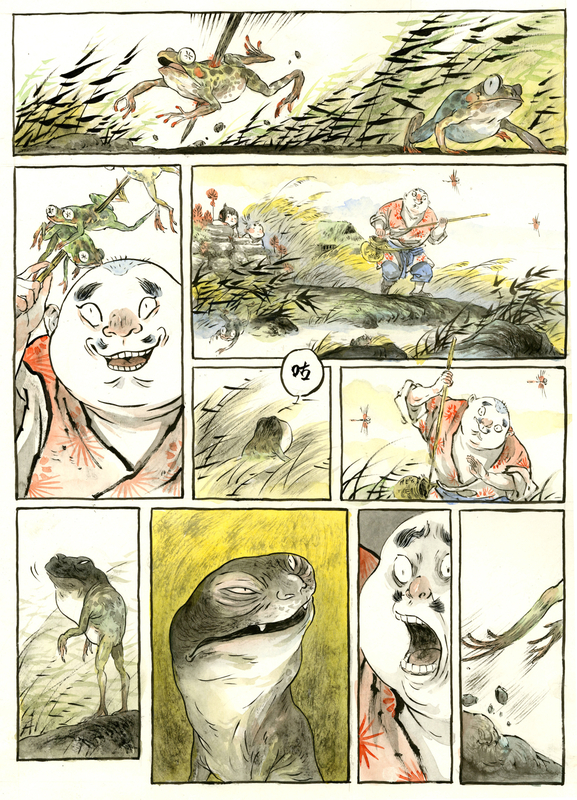 In that vein, her playful new Strip for ArtReview Magazine echoes traditional folklore, the two Chinese words in it, 咕 pronounced ‘koo’ and 呱 pronounced ‘kwa’, being the onomatopoeia for a croaking frog. Can you please describe the room or space you work and how you spend a typical day? My life is very simple. Usually when I am working, I get up around six in the morning and go out to do some exercise. When I get back, I do a bit of cleaning of my aquarium. Then I start working on my drawings which goes on till 11 at night, when I go to bed. In a quieter period with not too much work, I go walking in the mountains, or play with the village dogs, or meet with friends and have a good meal together. But even so I try to draw before going to bed around 11pm. What are your preferred media - pencil, ink, watercolour, gouache - and how much do you use digital software? 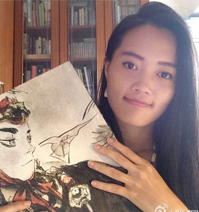 For my drawings, I start with a sketch in pencil, then I make the outlines in ink and apply colour with watercolours. To correct differences in the colouring in the scan, I use Photoshop, but for a long time now I’ve not drawn on a computer. 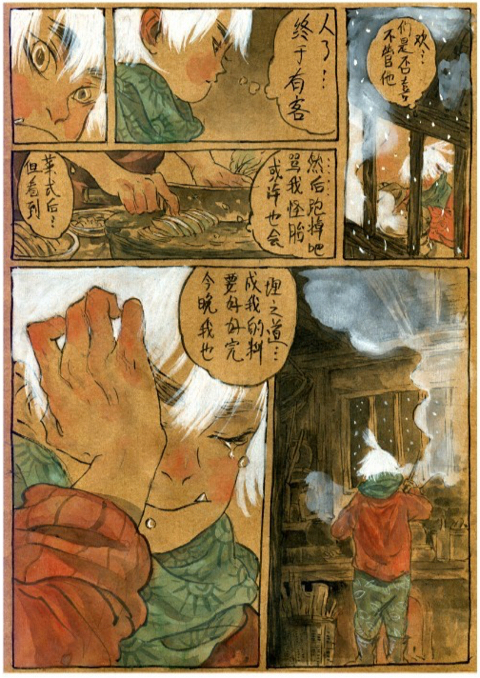 How were you influenced by reading Chinese comics or lianhuanhua when you were young? 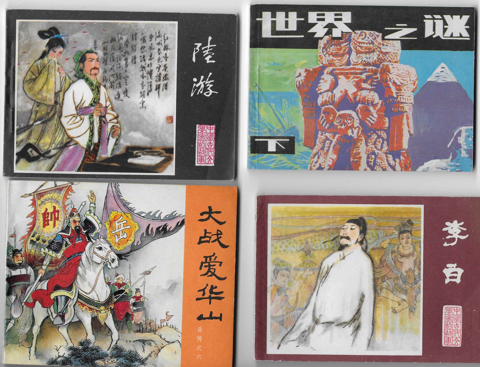 Which stories and artists from lianhuanhua were your favourites and why? My favourite comics series was called The Calabash Brothers, which was the first and only comics series I had as a child. 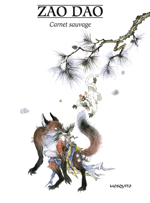 Its story and its style a bit like animated cartoons, and a bit like shadow theatre were so intriguing that I still get pleasure from reading and re-reading them today. What importance do lianhuanhua have for younger people today like yourself? The subject of what comics mean to our generation is a vast subject and I can’t speak about it as if I represent my whole generation. All that I can say is that for each generation comics influences a great number of artists. It’s a shame that I couldn’t read enough old books of comics, because today they can no longer be easily found. Artists of the past drew of lots of characters and objects from real daily life, so they all possessed a very solid graphic foundation for their creating in the future. Their comics stories always have a close link to everyday life. I hope that young people of my generation will want to look at them again and get to know them, so they will discover the serious side of their work and will distance themselves from superficial, fashionable things. What did you like and learn from reading manga? 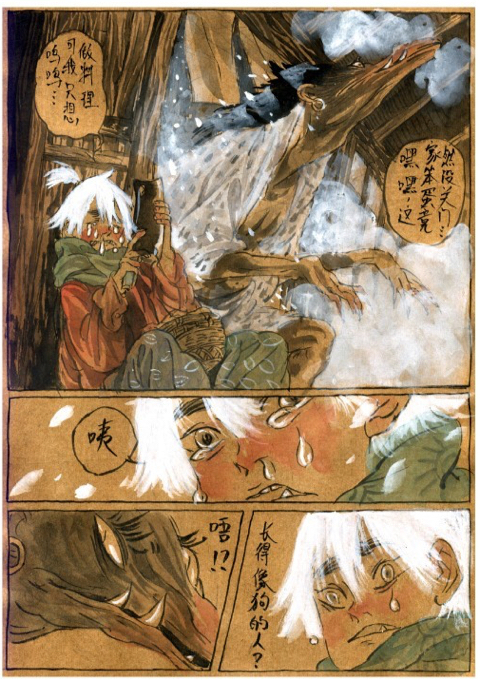 In Japanese comics, there are lot of different ways of telling a story, it’s amazing. And on top of that, their layouts have a natural, fluid rhythm to them. Reading works like these, you always learn something, for example how to dig deeper into the subtlety of a character’s personality. 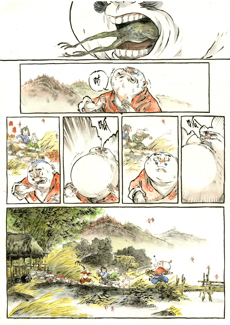 Among the Japanese authors, I prefer Sakaguchi Hisashi and Mizuki Shigeru. 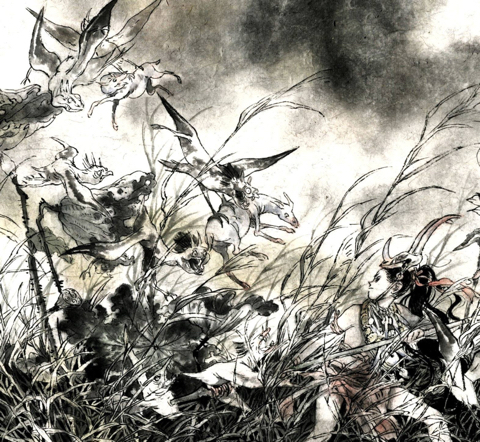 What do you admire about the artwork of Chinese artist Dai Dunbang (b. 1938)? What are his best lianhuanhua? I had the chance to visit venerable Chinese artist, Mr. Dai Dunbang, who is quite an elderly person but has a very lovable and open personality. 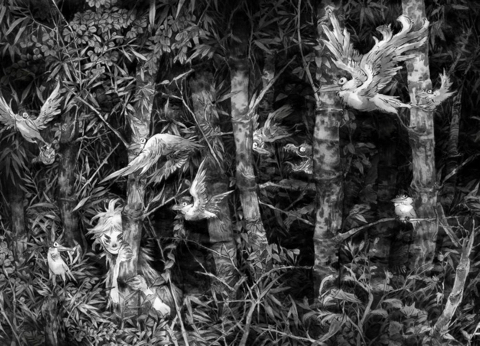 His deep knowledge of popular art and his lively realistic style come through in every line he draws with his brush. The characters in his drawings are also excellent, you can see they are the fruits of several decades of work and that deserves our respect. 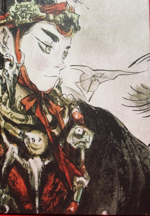 Among his works, the ones I prefer are his adaptations of Dream of the Red Chamber and The Water Margin. Please describe your first art book, and how you composed it. 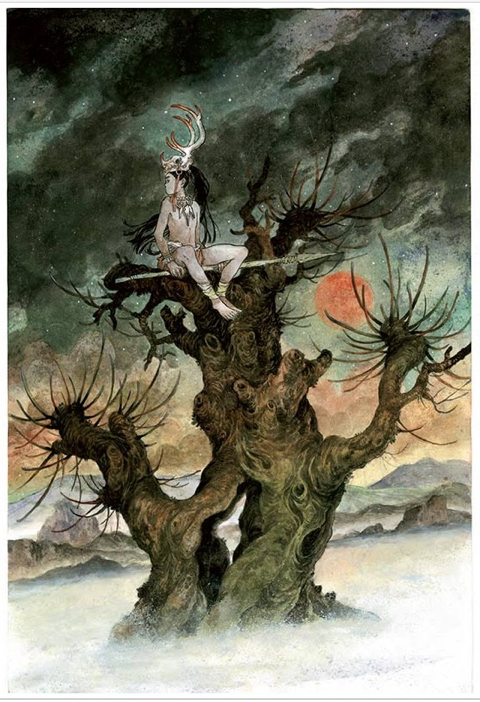 When I started Song of Sylvan, I was in a difficult phase, I had to make choices and my portfolio was almost empty. Thinking about this, I understood that a work of creativity demands total concentration. If you focus on money or other things, that blocks creativity. So I decided to concentrate totally on my creative work for two or three years, in the hope that by making this book, I would get to know my craft and its purpose. During these years, as I made progress, I had to take on small commissions, so I could then concentrate on what was for me my main work. I also travelled from province to province to avoid unhelpful disruptions. In this way I was able to make my drawings in great concentration and as I intended. I was very relieved the day I finished this story! How did you get your first book (cover above) published in July 2015? I finished Song of Sylvan in April 2015. I remember that the Chinese publisher decided to launch its sale on the internet on the morning of my 25th birthday in July. Right away, lots of readers and friends were waiting specially for that moment. As usual, I went to bed around 11pm the night before. What surprised and touched me is, when I woke the following morning, the 4,000 copies of the first printing has all sold. So immediately, I had to see my publisher to prepare a second printing. As an amusing detail, one reader bought a bag of my pencil shavings, which my publisher and I had saved as a joke, never thinking someone would really buy them! In the end, the money from the sale of these shavings, plus the money from another signing session was donated to an organisation which helps the education of poor local children. 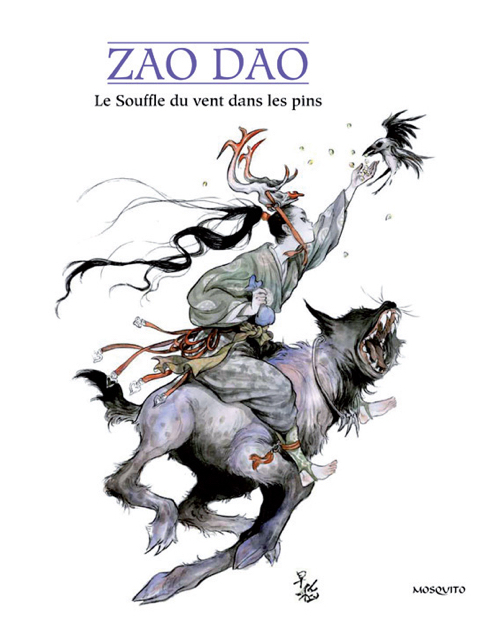 Apart from the edition of some narrative text, how is the French version, entitled Le souffle du vent dans les pins (‘The Breath of The Wind in the Pines’) (cover above), different from the original Chinese edition? Above all, the French version of this book from Mosquito is different from the Chinese in the format and paper. Holding it in your hands, you can feel the difference. Both of them have a feeling of their own. How do you engage with your 150,000+ followers on social media Weibo? What have you discovered from them? I write to them and from time to time send notes or tell little funny stories on a blog for my fans. It’s a way to thank them for their loyal support, because they are excellent readers, they know how to think about it and sometimes give me inspiration. 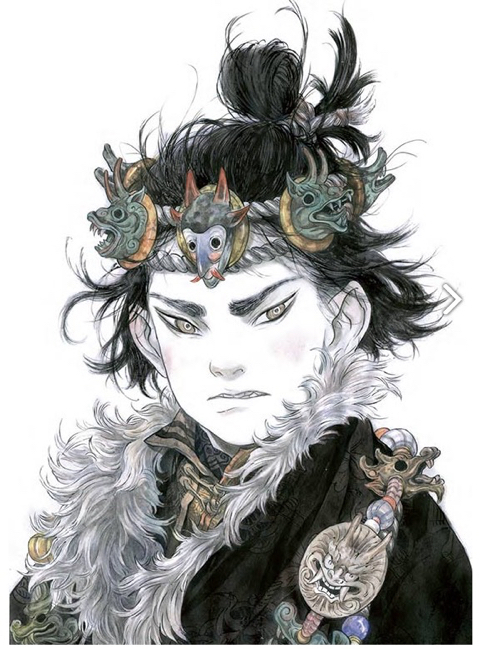 How would you like to see comics publishing improve and expand in China? 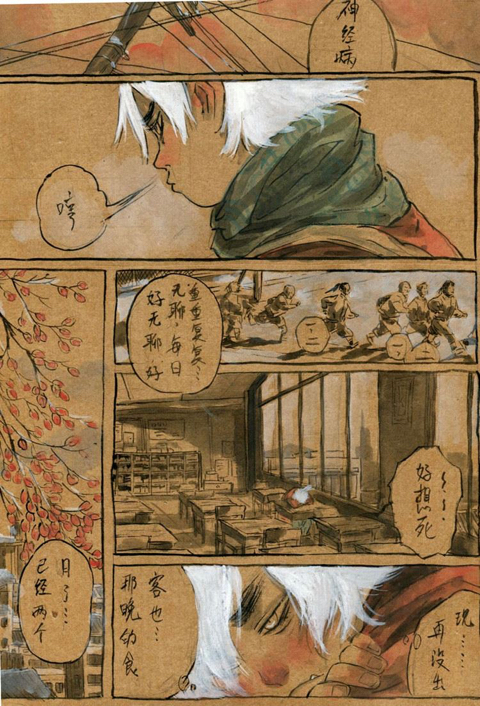 If China could resolve the big problem of the piracy of the authors’ rights, and so protect their rights and interests, the art of comics would develop more harmoniously. 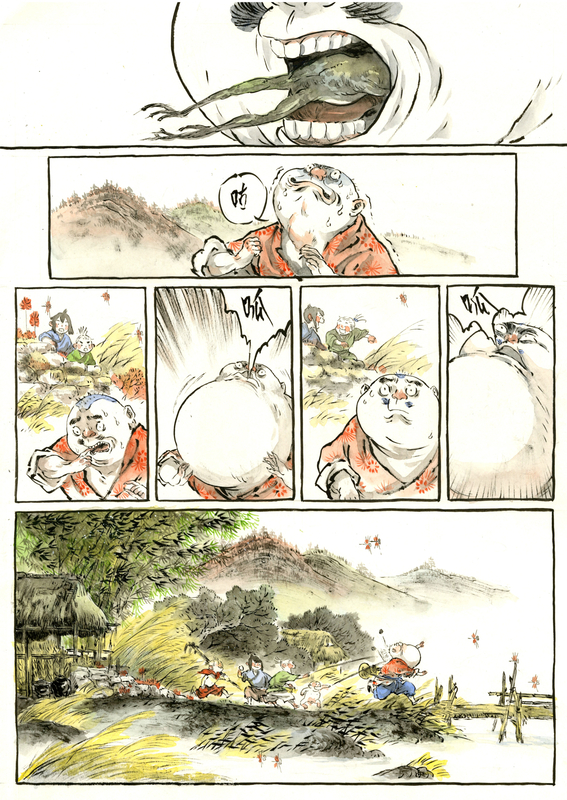 Can you tell me about your loose short comics you post online - are these very spontaneous, even unplanned? 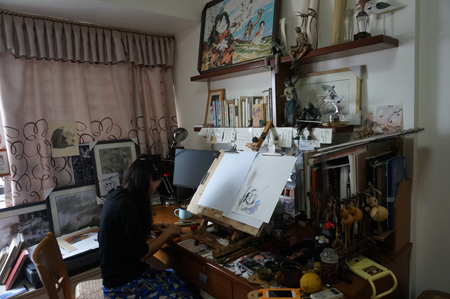 The drawings I put on line on my website reflect and share daily life, there is no goal or precise project behind them, I make them for my own pleasure. 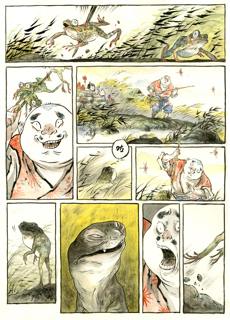 How did you first trips go outside to China, for example to the comics festival FIBDA in Algiers? Algiers is a beautiful city like cities in France. The festival there was really friendly, I really like how warm the people there were. The only small snag was my weak stomach, like an old person’s, which after eating a lovely cheese salad was upset for a whole month. You mentioned in your interview for Actua BD that you are writing the scenario for a graphic novel. How is that coming along? 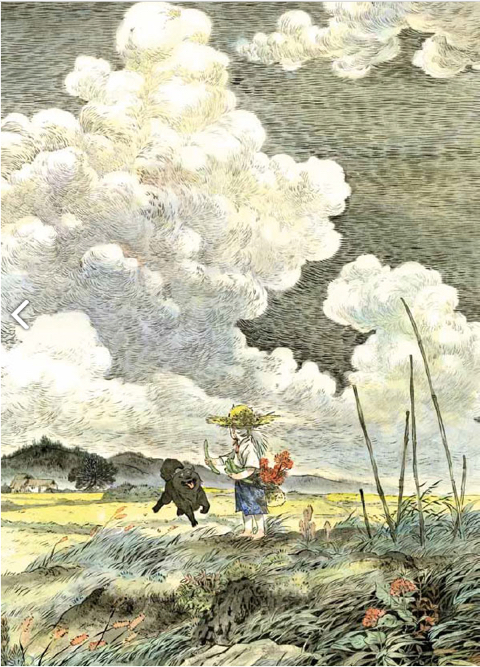 Can you tell us anything about the characters or setting perhaps? The opening profile originally appeared in ArtReview Magazine, Summer 2016.